On Monday afternoon, offensive tackle Ryan Clady went on the radio and said he would not be reporting to minicamp and was unsure if he would show up for training camp in late July. Clady is refusing to sign his one-year, $9.8 million franchise tag and is recovering from shoulder surgery, so Denver has been slow to offer him a multi-year deal—precisely what Clady has been seeking. But the July 15 deadline is approaching, which may push both sides to the negotiating table. Today, for the first time since last July(! ), #Broncos reached out to Ryan Clady's camp to talk contract. Previously, it was radio silence. Rapoport notes that this is the first time the Broncos have discussed Clady's contract with him since last year. If Clady does not sign a multi-year deal (or his franchise tag) before July 15, he will not be allowed to sign a long-term deal until next offseason and will be forced to either sign a one-year deal or hold out into 2014. It seems unlikely that Clady will want to extend his holdout—which gives the Broncos leverage, especially with Clady recovering from an injury. 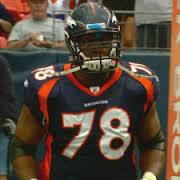 The Broncos want to see how Clady plays after surgery, so the team may be unwilling to lock him up long term (yet). If that is the case, signing his franchise tag would be Clady's only alternative to holding out. All of this, of course, assumes that Clady and the Broncos won't agree to a long-term deal before the 15th, and they might. If they are willing to take a risk on Clady's health, the Broncos have plenty of cap room to sign him. According to Spotrac.com, Denver has $10,413,631 in 2013 cap space. Clady will likely sign eventually, the question is: Will it be a one-year deal or multi-year deal?